So this week I gave a lecture about how collectors and the market get weird with art at the University of Utah. It was a lot of fun for me, and it seemed to go over alright. I took as a point of reference an earlier, well-known lecture at the UofU by Robert Smithson, the audio of which has posthumously been repackaged–without much justification, based on my research–into Hotel Palenque, a “multimedia installation” work that was purchased by the Guggenheim Museum. It was only during a post-game wrapup with Prof. Monty Paret, the contemporary art historian who invited me, that I learned Hotel Palenque was only the university’s second most infamous artist lecture. After the famous Fake Andy Warhol lecture tour of 1967, that is. From the lecture to the reception following, several people were suspicious that it was not, in fact, Warhol, but an impostor. The school held off on payment of the $1,000 speaking fee for several months. 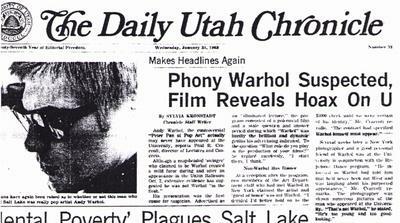 Then on January 31, 1968, after comparing photos of the U’s speaker with film footage of the artist, the Chronicle announced “Phony Warhol Suspected, Film Reveals Hoax On U”. It took about a week for Warhol–via then-manager Paul Morrissey–to come clean. The impostor–who did not actually look anymore like Warhol than anyone with a shaggy silver ‘do and a pair of Wayfarers–turned out to be Allen Midgette, a young actor and Warhol posse member who appeared a couple of months later in Warhol’s Lonesome Cowboys. [Shooting for Lonesome Cowboys took place in Arizona at the end of January 1968, just as the UofU story picked up.] He appeared in the artist’s place at the University of Oregon; Linfield College in McMinnville, Ore.; and at the Univ. of Montana in Missoula. 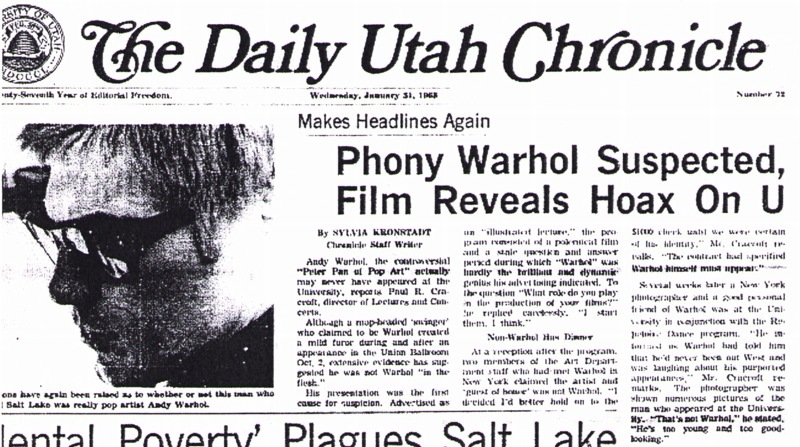 The one-line mention of sending a double on a lecture tour is in Warhol’s art history bio, but I’ve never seen or heard any details of how the lectures appeared from the duped audience’s standpoint, nor how the impostor was unmasked, largely due to the doubts of people at the University of Utah and the investigations of the school paper. 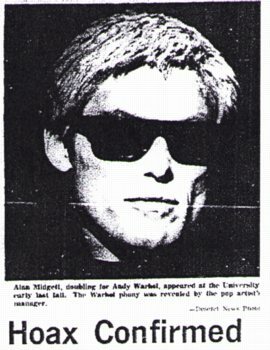 The Chronicle articles are very focused on recognizing Warhol, getting Morrissey to come clean, and what should happen to the $1,000 fee. There’s very little about the content of the lecture or even about Warhol’s art generally beyond a couple of namechecks of Campbell’s Soup. I’ll excerpt the Daily Chronicle articles below. Andy Warhol, the controversial “Peter Pan of Pop Art” acutally may never have appeared at the University, reports Paul A. Cracroft, director of Lectures and Concerts. Mr. Cracroft then went to New York for a convention and asked Warhol’s manager Paul Morrissey if he could meet Warhol to determine if it was actually he who had appeared. Morrissey agreed, but Warhol never showed up, claiming he was too busy. Mr. Cracroft later obtained a documentary film from Indiana University, which featured Warhol. After comparing this with the photos taken here, Cracroft and a KUTV newsman agreed he was not the same man who had appeared here in October. Two days later, on Feb. 2, Angelyn Nelson, Junior Editor-in-Chief, appears to have taken over the story. I’ll post those article transcripts, including a phoner where the journalist wrings a confession out of Paul Morrissey, separately.